Need firm guarantees on number of jobs and range of wages. Companies often come back again and again, as blackmailers tend to, seeking yet more blandishments. And nothing stops them from walking away when times get tough. Under the deal, Foxconn would not need to obtain state permits ordinarily required to discharge dredged materials into local wetlands. Nor would Foxconn have to submit to standard environmental impact studies and other state environmental regulations. Large cities in China are becoming uninhabitable because of pollution. Yet Walker will relieve them from Wisconsin environmental regulations that bind other Wisconsin companies. This deal, done in haste, is based on the desperation of Scott Walker. He turned down more than $800 million in federal train money, a partial return of federal taxes paid by Wisconsin citizens, to establish his doctrinal purity to potential conservative Republican presidential delegates around the country. He even paid a large settlement to let Wisconsin out of its initial obligations to a private company with respect to the train. That $800 million would have created more than 4,000 high-paying jobs constructing the train. He also turned down hundreds of millions of dollars in Medicaid money, to contrast himself with Governors Chris Christie and John Kasich who had accepted the Medicaid money and were running against him in the Republican primary for President. Now, he’s about to bind the state for up to $3 billion, at a payment of approximately $200 million a year for 15 years. That’s actual cash. That $3 billion has to come from somewhere. Because Wisconsin law requires a balanced budget, it can only come from (a) increased taxes on businesses and individuals other than Foxconn, or (b) $3 billion in further reduced spending on healthcare, road maintenance, public education and the University of Wisconsin. The Republicans argue that while Foxconn is a net loss for the state, it’s worth it because satellite industries — restaurants and suppliers — will pop up in the area as a result. This is highly speculative and doesn’t justify a desperate deal. In addition, Foxconn itself has a slippery record in living up to its commitments around the world. It has also shown actual contempt for its employees. The Foxconn CEO, Terry Gou, was quoted in 2012 at a company party held at the Taipei Zoo, where he described his one million employees worldwide as “animals.” Gou then had Chin Shih-chien, the Director of the Zoo, participate in Foxconn’s parent company’s annual review and spoke to his executives about how to manage animals based on their temperaments. Gou said “I am managing one million animals every day and it’s such a headache.” Gou will regard Wisconsin workers as the same. A man who views his employees as animals will also view the people negotiating against him as animals, in this case sheep to be shorn. 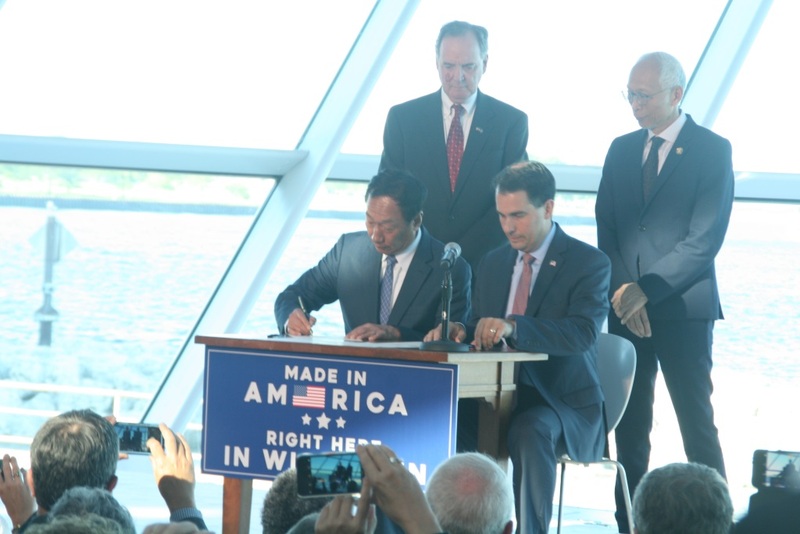 Walker has simply agreed to virtually everything Foxconn demanded, out of political desperation, to give the illusion of job creation which wouldn’t be realized until well after the 2018 election. The Republicans are giving the impression of 13,000 jobs being created at an annual average wage of $53,000. But there is nothing in the Memorandum of Understanding that requires Foxconn to produce 13,000 jobs, or any jobs, and the word “average” is misleading. If Bill Gates is talking to a homeless person, their average net worth is $40 billion. That’s because Bill Gates’ net worth is $80 billion, and the person to whom he is speaking has a zero net worth. We don’t know how many high salaried executive, engineer, and even investor compensation is included in that figure, and how low the pay of most of the jobs really will be. At the same time, the state should explore whether Foxconn is legit in this case, despite its slippery history, and whether a fair agreement can be reached. We bargain from a position of strength, not desperation. We possess the perfect location. We are right in the middle of the country, and the Racine county site is situated along major interstate and rail lines. The proposed plant would be close to Mitchell Field and O’Hare Airport. Racine and Kenosha counties can deliver 35 million gallons of spare water capacity between them, and Foxconn’s flat screen production is water intensive. Finally, we offer proximity to Amazon’s warehouse for the sorting and shipping of Foxconn products. The correct approach for Wisconsin in my view is to remove Walker’s desperation from the equation, and focus in a professional way. Professional negotiators who have the good of the state in mind, rather than Walker’s, should reopen the dialog with Foxconn. At a minimum, there should be no waivers of regulations that bind other businesses in Wisconsin. There should be firmer guarantees on the number of jobs and the range of wages. The amount demanded by Foxconn should be countered with something more reasonable. The $3 billion demanded is excessive — it is far more than any amount that the state could hope to recover in return. Bottom line, we should absolutely pursue this in a reasoned and professional way, but we should not simply turn over the keys to our treasury to a foreign company with a slippery record. This column originally ran in the Journal Sentinel.